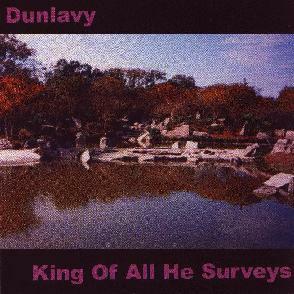 Dunlavy - "King Of All He Surveys" / Dunlavy - "The Alison Effect"
As I promised last time, I do have a few more words to say about the (no-longer-quite-so-) solo project out of Houston, TX called Dunlavy (or The DunLavy as it sometimes appears). Founded and fronted by ex-The Mike Gunn bassist Scott Grimm, the project involves a full orchestra of instrumentation with guitars (both acoustic and electric), bass, synthesizers and other electronic devices, and various forms of percussion. 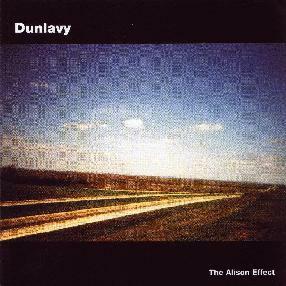 This review will cover both of the newest releases, the fourth Dunlavy release on the 'home' label in Houston (Fleece Records) and also the fifth just out from Tony Dale's outfit in Australia (Camera Obscura). Both CDs are of typical LP length (40-45 min. ea. ), but hardly are limited in musical statements, whether eleven tracks are offered (as on 'King') or just five (as on 'Alison'). 'King of All He Surveys' contains exactly no liner notes whatsoever, so I am left to believe that this creation was by the hand of Mr. Grimm (and his omnipresent puppy friend 'Dun') alone. The dreamy 'Unstable' immediately puts forward one of Grimm's most notable signatures, a multi-layered acoustic guitar approach that has an intertwining character that makes your own thoughts and emotions get lost somewhere in the mix. 'Captain Space' is a seven-minute creation that is presented in three different segments that are effectively sprinkled throughout the album to give the listener a familiar sense of one common motif. All three are colored with a muffled voiceover in triplicate and a number of other cosmic effects amongst the acoustic guitar backdrop, until in Part Three it finally ends with what seems to be a spaceship landing. The middle part of the album is mostly an amalgam of shorter musical statements (some instrumental, others with voiceovers) that alternately swap acoustic and electric sounds as well as pace, "Big Finish" being one of the more notable compositions. The lengthier pieces "Scott Dewey" and "Everything" were saved for later on. The former relies on a heavier, stoner-style guitar riff to power its march forward into another realm, and also includes a chant-style singing voice here and there. A fine slab of cosmic rock, though brought down a level by employing (as throughout this particular album) drum robots. "Everything" suffers a little less in this way by being more laid-back most of the time, letting the very real guitars and keyboards take center stage, at least up until the full-"band" rock-out that is inserted into the middle of the final offering. Dunlavy, with these two most recent efforts, seems in one sense to be a tad less forward-thinking than what I had heard in 'John Merkel is a Miracle' (reviewed in last issue). But then I think great musical ideas are still being developed here very nicely and I think Grimm's new partner has added in a number of new dimensions (and an all-important, to me at least, human-drum-machine). So if you were a Dunlavy virgin but intrigued by what you read here, I might be inclined to suggest a double-fisted reach to acquire both 'John Merkel' and 'The Alison Effect' and then proceed from there. I doubt, though, that Grimm has been involved in much of anything that didn't exhibit a great deal of merit. The Mike Gunn family tree (including also Charalambides and Linus Pauling Quartet) is a psychedelic family that should not be overlooked by any means. Fleece Records (and Dunlavy by association) can be reached at P.O. Box 70012, Houston TX 77270, or by e-mail to kurt@soundexchangehouston.com. Visit the Fleece web site at: http://soundexchangehouston.com/fleece/. Camera Obscura is best reached via their website at http://www.cameraobscura.com.au.